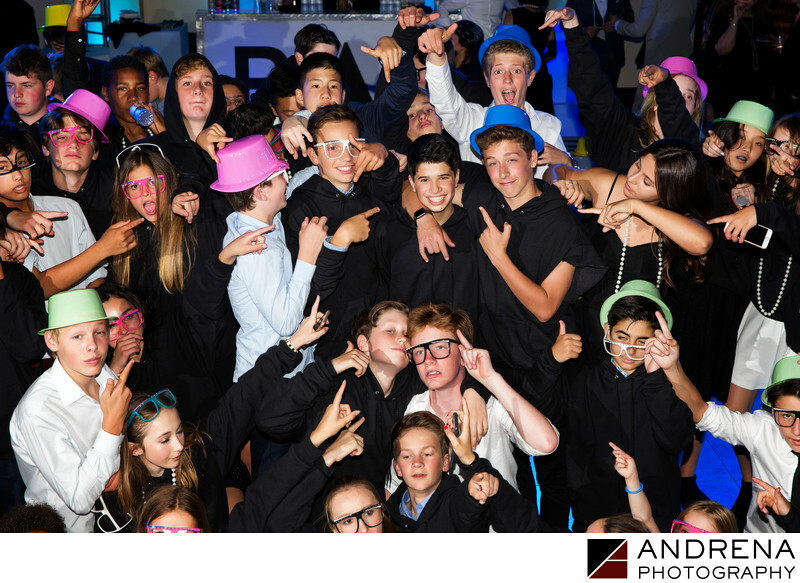 In terms of photography, a kid's top priority for what will appear in his Bar Mitzvah album is usually a fun group shot of all of his friends, and these guys prove that Los Angeles kids know how to ham it up for the camera. When taking an overall group shot of the kids from further back, we also like to include a closer view like this one, to really zero in on everyone's expressions. This photo was taken when the party was already in full swing, when many of the kids could show off their party swag, consisting of colorful hats and sunglasses. But by far the biggest standout is the image's focal point, which is the Bar Mitzvah's boy's genuine smile. How could he not be having the time of this life knowing all his closest friends have come to celebrate his special day?